Biography: Graeme Macrae Burnet was brought up Kilmarnock, Ayrshire and now lives in Glasgow. He has also lived in the Czech Republic, France, Portugal and London. He has appeared at festivals and events in Australia, New Zealand, the US, Russia, Estonia, Macau, Ireland, Germany and France, as well as in the UK. His first novel, THE DISAPPEARANCE OF ADÈLE BEDEAU (Contraband, 2014), received a New Writer’s Award from the Scottish Book Trust and was longlisted for the Waverton Good Read Award. A second Inspector Gorski novel, THE ACCIDENT ON THE A35, was published in 2017. HIS BLOODY PROJECT (Contraband, 2015) won the Saltire Society Fiction Book of the Year Award, and was shortlisted for the Man Booker Prize and the LA Times Book Awards. It has been published to great acclaim around the world. A brutal triple murder in a remote Scottish farming community in 1869 leads to the arrest of 17-year-old Roderick Macrae. There is no question that Macrae committed this terrible act. What would lead such a shy and intelligent boy down this bloody path? 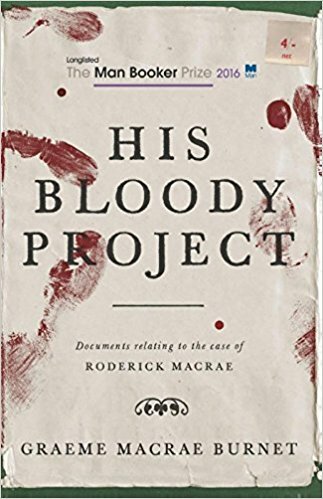 Presented as a collection of documents, HIS BLOODY PROJECT opens with a series of police statements taken from the villagers, which offer conflicting impressions, throwing Macrae's motive and his sanity into question. Manfred Baumann is a loner. Socially awkward and perpetually ill at ease, he spends his evenings quietly drinking and surreptitiously observing Adèle Bedeau, the sullen but alluring waitress at a drab bistro in the unremarkable small French town of Saint-Louis. But one day, she simply vanishes into thin air. When Georges Gorski, a detective haunted by his failure to solve one of his first murder cases, is called in to investigate the girl’s disappearance, Manfred’s repressed world is shaken to its core and he is forced to confront the dark secrets of his past. THE DISAPPEARANCE OF ADÈLE BEDEAU is a literary mystery novel that is, at heart, an engrossing psychological portrayal of an outsider pushed to the limit by his own feverish imagination. There does not appear to be anything remarkable about the fatal car crash on the A35. But one question dogs Inspector Georges Gorski: where has the victim, an outwardly austere lawyer, been on the night of his death? The troubled Gorski finds himself drawn into a mystery that takes him behind the respectable veneer of the sleepy French backwater of Saint-Louis. Graeme Macrae Burnet returns with a literary mystery that will beguile fans of HIS BLOODY PROJECT and THE DISAPPEARANCE OF ADÈLE BEDEAU. Darkly humorous, subtle and sophisticated, THE ACCIDENT ON THE A35 burrows deep into the psyches of its characters and explores the forgotten corners of small-town life.